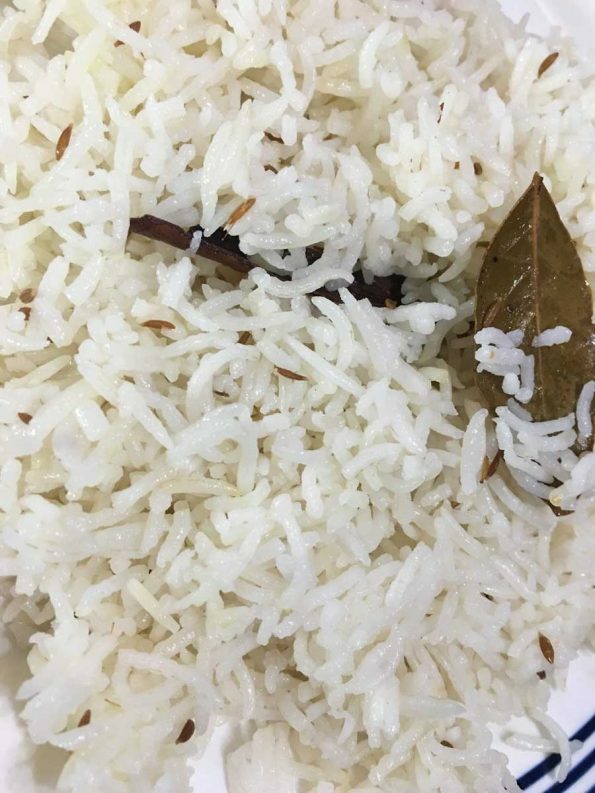 Instant pot jeera rice recipe using basmati rice is easy, simple and quick Indian style instant pot rice pilaf recipe/pulao recipe (without vegetables) prepared using mild, aromatic and flavorful spices. 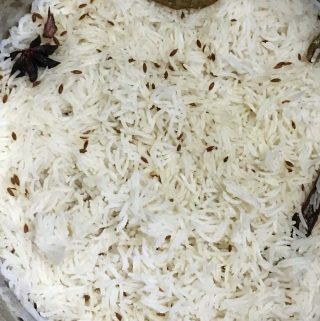 Jeera rice is basically cumin seeds flavored rice where you primarily use cumin seeds to flavor the rice, along with other mild whole spices which are aromatic and flavorful. You can use a 6 quart instant pot to easily prepare this Indian style jeera rice. 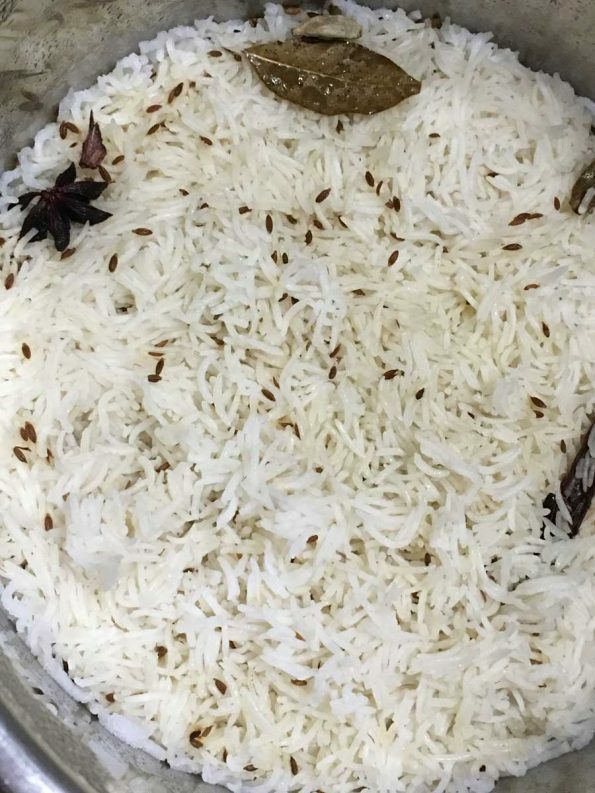 Since we usually use whole spices instead of spice powders, the color of the rice won’t change while the rice will be delicious, aromatic and flavorful with a white or ivory (off white color tint) to it. 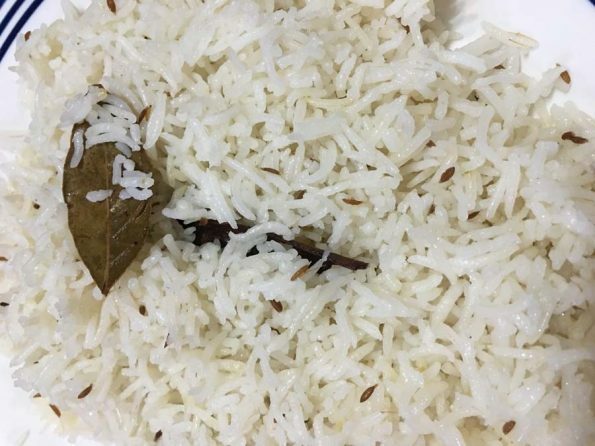 You may also add sauteed onions to jeera rice if you wish, but in this instant pot jeera rice recipe, I didn’t use any onions, I only used the necessary spices and it was very delicious and easy to prepare. Adding little ghee gives much flavor to the jeera rice. You can enjoy this jeera rice with any vegetarian curry, fresh yogurt or raitha as you wish. See this easy jeera rice recipe with onions which is prepared on stove top instead of instant pot, which too is an easy recipe for Indian style jeera rice. See all instant pot recipes in this blog here. So here is how you can make this easy, simple and quick jeera rice following this instant pot jeera rice recipe. 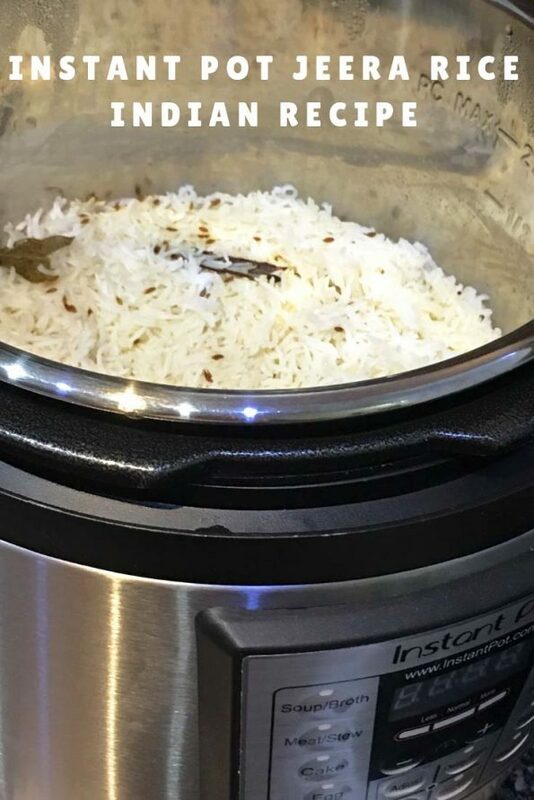 Instant pot jeera rice is easy, simple, flavorful, aromatic and delicious Indian style cumin seeds rice prepared using instant pot. 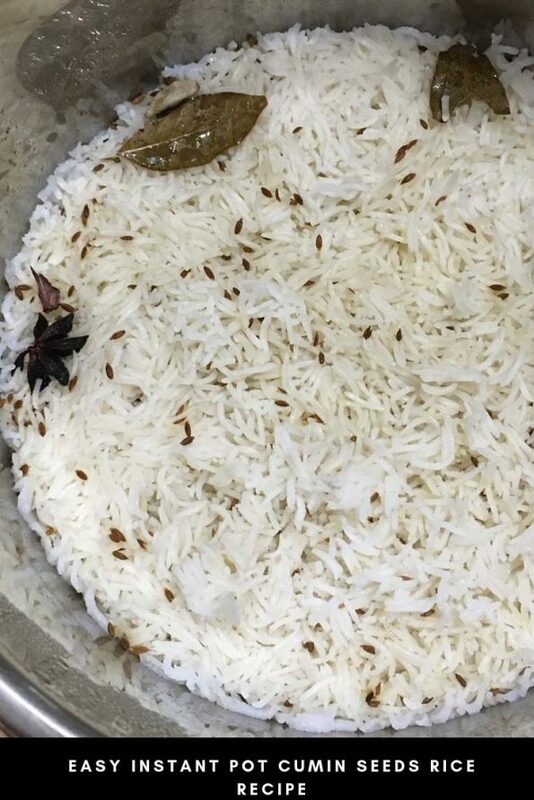 Keep the whole spices - bay leaves, cardamom pods, cinnamon stick, star anise and cloves together aside, separately from rice. Switch on the instant pot and press the 'saute' button. Add the oil and add the cumin seeds, wait for a few seconds until the cumin seeds start getting roasted. Once the cumin seeds are lightly fried, add the whole spices that you kept together to the pot, and mix well everything, let it all get lightly fried. Add the rice and salt and saute for another 1 to 2 minutes. Add the ghee and water, mix very well and press the 'keep warm' button. Close the instant pot with lid in sealing position. Now press the button 'manual' and pressure cook in high for 5 minutes. Once the cooking is done, the pot will beep and you can press the 'keep warm' button and wait for the pressure to naturally release which will take another few minutes. Once the pressure is all naturally released, turn the lid to venting position and open the lid. Stir the flavorful, aromatic jeera rice gently using a good spatula or gently mix using a fork. 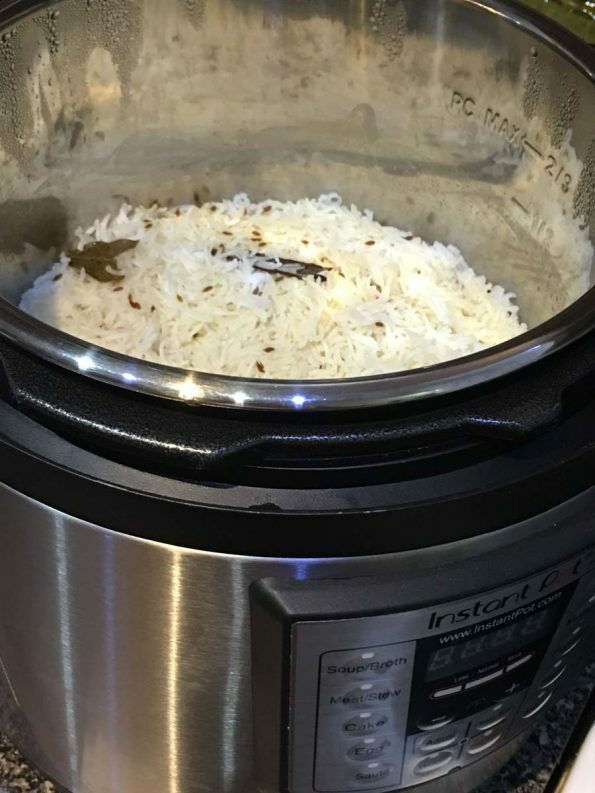 Now the delicious and aromatic instant pot jeera rice using basmati rice is ready to be served! You can serve instant pot jeera rice for a quick and easy lunch or dinner with sides or curry of your choice or with pickles, fresh yogurt, raitha etc as you wish. 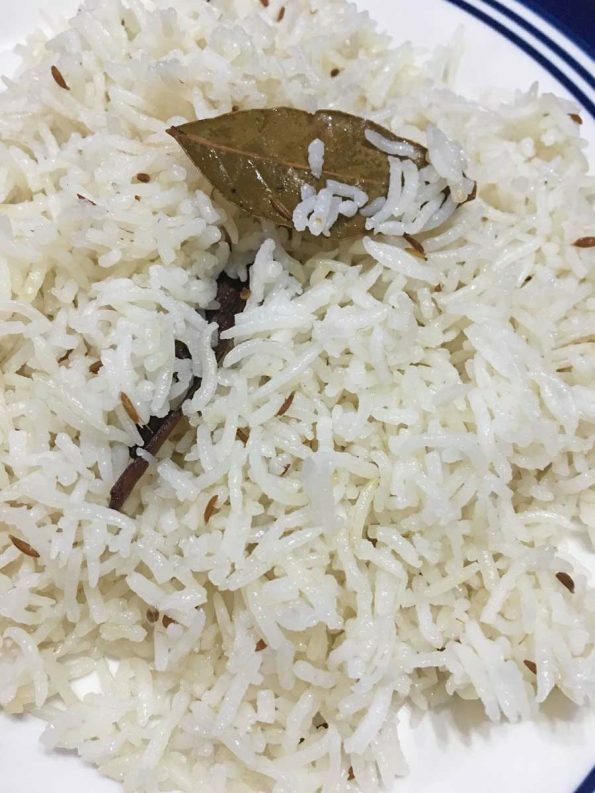 Hope you found this post on instant pot jeera rice recipe helpful in making easy, yummy and flavorful jeera rice using instant pot.